The MHC of cattle encodes two distinct isotypes of class II molecules, DR and DQ. Unlike humans, cattle lack the DP locus and about half the common haplotypes express duplicated DQ genes. The number and frequency of DQA and DQB alleles means that most cattle are heterozygous. If inter- and/or intrahaplotype pairing of DQA and DQB molecules occurs, cattle carrying DQ-duplicated haplotypes may express more restriction elements than would be predicted by the number of expressed alleles. We are investigating whether duplicated haplotypes cause differences in immune response, particularly in terms of generating protective immunity. We have analyzed the Ag-presenting function of DQ molecules in two heterozygous animals, one of which carries a duplicated haplotype. We compared the class II isotype specificity of T cell clones recognizing a putative vaccinal peptide from foot-and-mouth disease virus (FMDV15). We show for the first time that bovine T cells can recognize Ag in the context of DQ molecules. We also present evidence that interhaplotype pairings of DQA and DQB molecules form functional restriction elements. Both animals showed distinct biases to usage of particular restriction elements. Mainly DQ-restricted clones were derived from the animal with duplicated DQ genes, whereas the majority of clones from the animal with a single DQ gene pair were DR restricted. Furthermore, haplotype bias was observed with both animals. These experiments show that understanding of class II chain pairing in addition to knowledge of the genotype may be important in vaccine design where effective epitope selection is essential. The role of MHC DQ gene products in human immunology continues to perplex and puzzle immunologists. Although HLA-DR, -DQ, and -DP products can all present Ag to T cells (1), human Ag-specific T cell responses appear to be mainly DR restricted (2). It is unclear if this relates to functional differences between the different locus products or relates more to experimental artifacts in cloning procedures, for example DQ-restricted T cells may require growth factors not present in the culture medium or specific APC. Certainly DQ molecules are differentially expressed on human APC (3, 4), perhaps because HLA-DQ genes have locus-specific transcription control elements (5). However, when DQ-positive transfectants were used as APC, a high frequency of allo-DQ-reactive T cells was detected in peripheral blood (6). In addition, DQ-restricted responses to a variety of Ags have been reported (7, 8, 9, 10). Nonetheless, many studies would suggest that human DQ molecules play a different role from DR molecules. DQ alleles are associated with many autoimmune diseases, both as protective and susceptibility alleles (11, 12, 13). They may also be associated with suppressive responses (14). In addition, DQ molecules may have different binding cleft structures from DR molecules (15), which probably leads to different peptide binding profiles (16). Indeed, murine class II I-A molecules (HLA-DQ homologue) appear to bind peptides with a different hierarchy of anchor positions (17). Cattle express BoLA-DR and BoLA-DQ locus products. The DRA, DRB3, DQA, and DQB genes are transcribed, and both DR and DQ products can be detected at the cell surface (reviewed in Ref. 18). Each haplotype expresses a single DR product and one or more DQ products. About half of the common class II haplotypes appear to have duplicated DQ genes, and where the DQ genes are duplicated both sets of DQ genes can be expressed. This duplication, combined with the polymorphism of both DQA and DQB genes, has the potential to markedly increase variation at the cell surface due to inter- and intrahaplotype pairing of DQ α- and β-chains. Thus cattle are likely to express several class II gene products, all of which may make positive and negative contributions to the immune response to particular Ags. As with HLA class II molecules, bovine class II DQ molecules may be differentially expressed (19). As a model system for bovine class II function, we have measured CD4+ T cell responsiveness to a 40-aa peptide derived from foot-and-mouth disease (FMDV15),3 which requires processing for presentation and contains several T cell epitopes (20, 21, 22). We have identified MHC haplotypes associated with high and low responsiveness to this peptide (20). As in humans, it can be difficult to ascribe T cell responses to specific restriction elements because of close linkage between the class II genes. To define the roles of the individual class II products in Ag presentation and T cell responses, we have cloned and sequenced the class II genes expressed by a pair of immunologically characterized cattle (Refs. 23, 24, 25 and our unpublished data). These animals shared one MHC haplotype and exhibited distinct responses to immunization with the FMDV15 Ag (20, 21). Here we show that bovine DQ products can present the FMDV15 Ag and that important restriction elements for FMDV15 may be generated by interhaplotype DQ heterodimer formation. In one high-responder animal, the majority of FMDV15-specific clones were DQ restricted. As bovine DQ molecules are presumably structurally similar to human DQ molecules (26, 27), these studies should improve our understanding of DQ function. Friesian (Bos taurus) castrated male or female cattle from the Roslin Institute’s herd were used for this study. The animals were clinically normal and were over 6 mo of age. The two immunized animals had well-characterized responses to immunization with FMDV15 peptide (see below) (20, 21, 22, 23). Animal 1 was considered to be a high responder, and animal 9 as an intermediate responder both in terms of their T cell and Ab responses (21) (see Table I⇓). The bovine lymphocyte Ag (BoLA) haplotypes of some of the animals in this study were defined as part of the Fifth International BoLA Workshop (Ref. 28 ; see Table I⇑), and the sequences of DRA, DRB3, DQA, and DQB alleles from the immunized animals have been determined (see Table II⇓; Refs. 23, 24, 25 ; our unpublished data). Polymorphism in exon 2 of the DRB3 and DQA genes of all of the animals in this study was analyzed by PCR-RFLP as described by van Eijk et al. (29) and Ballingall et al. (30), respectively. The DRB3 method recognizes most polymorphism, with over 50 patterns predicted from the 70 sequenced alleles (http://www2.ri.bbsrc.ac.uk/bola/drb3pcr.htm). DQA PCR-RFLP analysis is less powerful, with 19 patterns predicted from the 39 available DQA allele sequences (http://www2.ri.bbsrc.ac.uk/bola/dqarflp.htm). Combined typing of DRB3 and DQA loci was used to define class II haplotypes (see Table II⇑) that link specific alleles at the class II loci, including those that cannot be typed easily (e.g., DQB). The 40-mer peptide FMDV15 (31) (kindly donated by Dr. R. DiMarchi, Eli Lilly, Indianopolis, IN), comprises residues 200–213 and 140–158 of FMDV virus envelope protein 1 (VP1) coupled by a Pro-Pro-Ser spacer, with a dicysteine at the N terminus and Pro-Cys-Gly at the C terminus (i.e., Cys-Cys-(200–213)-Pro-Pro-Ser-(140–158)-Pro-Cys-Gly). It was prepared as described previously (20). The animals were immunized with FMDV15 in a 1:1 ratio of saline and nonulcerative IFA courtesy of Brian D. Morris (Guildhay Antisera, University of Surrey, Surrey, U.K.) as previously described (20). PBMC were separated on Ficoll/Hypaque (Pharmacia, Uppsala, Sweden) as previously described (32) and were resuspended in RPMI 1640 supplemented with 25 mM HEPES, 2 mM glutamine, 10% FCS, 5 × 10−5 M 2-ME, and 50 μg/ml gentamicin (Life Technologies, Paisley, U.K.) (complete medium). CD4+ T cell clones were derived from PBMC of two FMDV15-immunized animals. Before cloning, the CD4+ cells were expanded in vitro once with recombinant human IL-2 and once with FMDV15 (21). PBMC were used to generate the T cell clones and as a source of haplotype-defined APC (see below). To prevent autoproliferation, 107 cells were incubated with 20 μg/ml mitomycin C (Sigma, Poole, U.K.) at 37°C for 30 min and then washed twice. 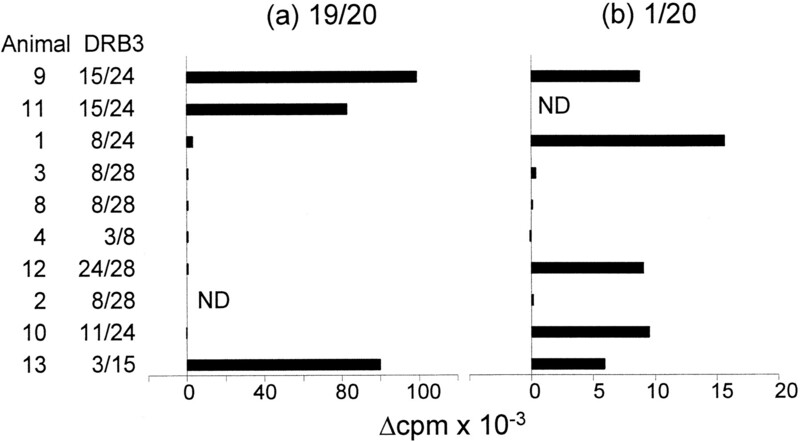 Proliferation assays were essentially as described elsewhere: T cell clones (1 × 104/well) (21) were incubated with mitomycin C-treated PBMC (6 × 104/well) in the presence and absence of 1 μg/ml FMDV15. No clones responded to Ag alone or to APC alone. For genetic restriction assays, mitomycin C-treated PBMC from defined haplotypes were used as APC. All clones were tested three or more times with each APC shown. The restriction elements used by the T cell clones were determined with the following mAb: J11 (bovine DR) (33, 34); VPM43 (ovine/bovine DRβ) (24, 35); VPM36 (ovine/bovine DQα) (34, 35); VPM44 (ovine/bovine DQβ) (Ref. 36 ; this paper) and R1 (bovine DQ) (Ref. 37 ; this paper). The isotypes of these mAbs are all IgG1, except R1, which is IgM. These were added at the beginning of the culture period at 1/200 dilution of ascites (extensively dialysed), which represented optimal blocking conditions (results not shown), as well as a five times excess of Ab activity as predetermined by FACS staining with these Abs. Cell proliferation was measured after 3 days by a final 6-h pulse with [3H]thymidine (Amersham International, Little Chalfont, U.K.), and uptake was assessed by liquid scintillation counting. All of the inhibitory mAbs had isotype controls internal to these experiments, which did not inhibit proliferation (results not shown). Peripheral blood T cells from both immunized animals, 1 and 9, responded to FMDV15, and proliferation was significantly inhibited by both anti-DR and anti-DQ mAbs (results not shown). T cells from animal 1 consistently showed significantly higher responses than those of animal 9, as described previously (20, 21). Most of the CD4+ clones were used in a previous study that resolved the restriction patterns seen in different clones to the level of class II haplotype (21). However, no information was available to determine the exact locus product presenting Ag to the T cell clones. The MHC class II locus product used for presentation of FMDV15 was determined with bovine-specific DR and DQ mAb by testing their effects on proliferation of FMDV15-specific clones derived from animal 1 (Fig. 1⇓, a and b). The majority of clones tested (13 of 15) were inhibited by VPM36 (DQα) and not by J11 (DR) or VMP43 (DRβ) (Fig. 1⇓a), indicating that they recognized FMDV15 presented by DQ. Groups of these clones showed slightly different restriction patterns with a panel of APC (see below). Only two clones from this animal were DR restricted as defined by inhibition by J11 and not by VPM36 (Fig. 1⇓b). However these two clones were clearly restricted to different DR alleles (see below). These data also show that the partially characterized mAbs R1 and VPM44 are specific for bovine DQ. Proliferation of individual CD4+ T cell clones derived from animal 1 to FMDV15 in the presence and absence of mAb specific for bovine class II DR (J11), DRβ (VPM43), DQα (VPM36), DQβ (VPM44), and DQ (R1). Representative clones (a and b) are shown and correspond to those shown in Fig. 2⇓, a and d, respectively. The frequency of clones is shown. Δcpm = cpm for test − cpm with medium alone. SD ≤ 10%. Both animal 1 and 9 were genotyped as described in Materials and Methods (Table I⇑). They were heterozygous for BoLA class I alleles and class II DR and DQ alleles. They shared one haplotype, DH24A (nonduplicated DQA and DQB loci). The nonshared haplotype of animal 1 (DH8A) had duplicated DQA and DQB loci, while the second haplotype of animal 9 (DH15B) expressed the same DQA and DQB alleles as DH24A (Table I⇑; Refs. 23, 24, 25 ; our unpublished data). Panels of APC were chosen from animals with related haplotypes (Table II⇑). All APC were typed at the DRB3 and DQA loci by PCR-RFLP analysis, and several were also typed as part of the Fifth International BoLA Workshop (Table II⇑; Ref. 28). In most cases, the PCR-RFLP typing data were consistent with conserved haplotypes characterized in the BoLA workshop (28), except that the two DRB3.2*11 APC (Table II⇑, APC 5 and 10) had different associated DQA PCR-RFLP patterns, suggesting that they had distinct haplotypes. Clones derived from animal 1 (DH24A/8A) and represented in Fig. 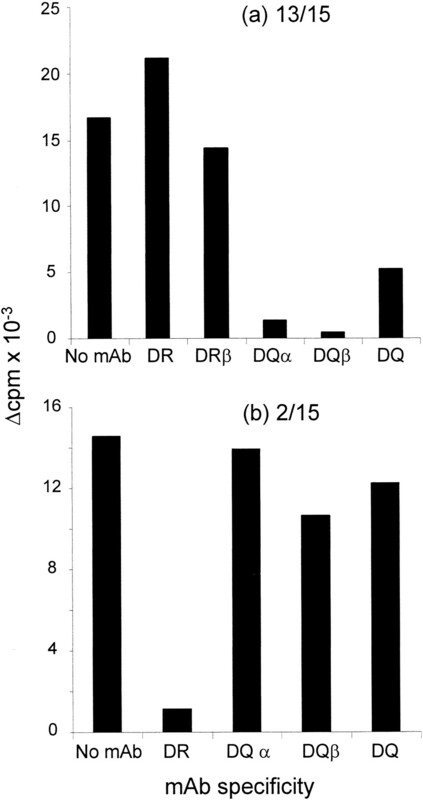 2⇓, a–c (10 of 12 tested with a wide range of well-characterized APC) were restricted to DQ (Fig. 1⇑a and results not shown). All 10 clones responded to Ag presented by DH8A+ APC but not to all DH8A+ APC. Six clones (represented in Fig. 2⇓a) only responded to APC expressing DH8A in association with DH24A, DH28A, or DH11A. The striking difference with the two clones represented in Fig. 2⇓b is that they responded to most DH8A+ APC tested, including APC4 (DH8A/DH3), but did not respond to APC6 (DH8A/DH24), unlike the first set of clones. The third set of clones (Fig. 2⇓c) had the most limited recognition of DH8A+ APC. Thus, all 12 of these clones are restricted to DQ molecules that depend on expression of both DH8A and another haplotype (often DH24A/28A). Sequence analysis showed that animal 1 expressed three DQA genes and three DQB genes (Table I⇑; Ref. 25 ; our unpublished data), suggesting that these complex patterns of DQ restriction may result from several different DQA/B combinations, each having the ability to bind and present. Our current data do not allow us to identify DQA/B pairs that are acting as restriction elements for these clones, but the DQA*0101/DQB*0101 gene pair can be excluded because APC expressing DH15B or DH24A without DH8A (i.e., APC 9, 10, and 11) were unable to present Ag to any of these clones (Fig. 2⇓, a–c). MHC class II restriction of individual FMDV15-specific clones derived from animal 1. The DR and DQ types of the panels of APC are shown in Table II⇑. Representative clones are shown (a–e). The frequency of clones with these restriction patterns is shown. DH8A/24A DR-restricted clones. The remaining two clones derived from animal 1 (Fig. 2⇑, d and e) were inhibited by anti-DR mAbs. One clone was restricted to the DH24A DR product (Fig. 2⇑d): all APC expressing DH24A presented to this clone, whereas APC expressing DH8A or DH15B without DH24A were unable to present to it. One further clone responded to FMDV15 presented by all DH8A APC only (Fig. 2⇑e), indicating that it recognized FMDV15 in the context of the DH8A DR product. DH15B/24A DR-restricted clones. Clones derived from animal 9 showed much simpler patterns of recognition. Of 20 clones tested with a wide panel of APC, 19 showed the same restriction pattern as the clone in Fig. 3⇓a. Only APC expressing DH15B were able to present FMDV15 to these clones. Because this animal only expressed one DQ gene pair, DQA*0101/DQB*0101 (Table I⇑; Ref. 25 ; G. C. Russell, unpublished data), and APC expressing DH24A without DH15B (i.e., APC 1, 10, and 12) were unable to present to these clones, these clones recognized FMDV15 in the context of the DH15B DR molecule. MHC class II restriction of individual FMDV15-specific clones derived from animal 9. Nineteen of 20 clones analyzed had a similar profile to that shown in a, whereas only one clone showed the restriction pattern in b.
DH15B/24A DQ-restricted clone. A single clone (Fig. 3⇑b) proliferated to FMDV15 presented by APC expressing DH15B or DH24A, implying that the restriction element used by this clone was the product of the shared DQA*0101/DQB*0101 gene pair. In this paper, we show for the first time that bovine DQ molecules can present Ag to bovine CD4+ T cells. Furthermore, clonal analysis indicates that functional interhaplotype pairings occur, and, in heterozygous animals, bias toward specific allelic products is observed. In one case, DQ restriction elements are used in preference to the available DR restriction elements. Although it was known that cattle express both DR and DQ class II molecules at the cell surface (34, 38, 39, 40), previous Ag presentation studies had correlated restriction only at the level of the class II haplotype (20, 41). Immune responsiveness to FMDV15 has also been previously correlated with class II haplotype (20). However, the tight linkage between the DR and DQ loci has prevented the precise identification of the restriction elements involved in Ag presentation or associated with high or low responsiveness. Integrating the anti-DR and anti-DQ inhibition data with the sequences of the expressed class II genes from the immunized animals gives us additional insights into the presentation of FMDV15 by these animals. Animal 1 is a high responder to FMDV15 (20, 21) in that the magnitude of its T cell proliferative response to FMDV15 (at 1 μg/ml) was significantly higher than that of animal 9 at all time points taken (20). Furthermore T cells from animal 1 consistently proliferated to FMDV15 at 0.01 μg/ml, whereas animal 9 only showed significant responses at 10-fold higher doses (20). Animal 1 also produced higher levels of anti-peptide and anti-viral Ab than animal 9, as measured by ELISA and virus neutralization titer (Ref. 21 ; results not published). This paper provides possible explanations for the complexity of restriction patterns exhibited by T cell clones from animal 1 as well as its high responsiveness. The FMDV-specific clones generated from animal 1 showed complex restriction patterns. The predominant response pattern for the DQ-restricted clones (Fig. 2⇑a) was for APC expressing DH8A in conjunction with DH24A or DH28A. The DQ molecules associated with the haplotypes DH24A (and DH15B) and DH28A are likely to be structurally and functionally similar. These haplotypes share both a serological specificity, Dw3 (28), and an allo-T cell specificity (42), yet all have different DR molecules (28). In addition, the DQB*0103 allele, associated with DH28A by RFLP typing data (28), differs from the DH24A DQB*0101 allele by only four conservative substitutions in the Ag-binding cleft (Y30-H, F61-W, F67-I, and Q70-R) (43). Thus, the DQ molecules of DH24A/DH15B and DH28A may belong to a class II supertype (44), sharing structural similarities that are reflected in both their peptide and TCR specificity. Thus, the most common restriction element(s) used by animal 1 were likely to be DH8A/DH24A interhaplotype DQ heterodimers. Such interhaplotype heterodimers have been reported for human DQA/B pairs (45). Animal 1 could potentially express four possible interhaplotype DH8A/24A DQA/B combinations: DQA*0101/DQB*1201; DQA*0101/DQB*1005; DQA*12011/DQB*0101; or DQA*2201/DQB*0101. However, it was not possible to determine which one(s) were used by these clones. In addition, animal 1, with its duplicated haplotype and three DQA and three DQB alleles, could potentially express a further five different DQA/B heterodimers at the cell surface, if intrahaplotype pairings can also occur. None of the clones derived from animal 1 recognized Ag in association with the DH15B/DH24A DQ gene product (Fig. 2⇑). We now plan to investigate the expression and function of intra- and interhaplotype DQ pairing by generating appropriate DQ transfectants. Of the 32 clones described in this paper, only one clone recognized FMDV presented by the DH24A-associated DR molecule (Fig. 2⇑d) and only one clone recognized FMDV presented by the DH24A-associated DQ molecule. These biased responses probably reflect both the frequency of specific T cells and hierarchies of binding affinity of FMDV15 subpeptides for specific MHC alleles. There may be competition between different MHC molecules for peptides. The overall T cell response seen in any individual may depend on the mix of locus products expressed. In addition, it is possible that there are differences in the levels of expression of different alleles, as has been suggested for human and murine class II genes (46, 47, 48), which may have functional consequences for the ensuing T cell response. As there are no mAbs specific for polymorphic determinants of bovine class II molecules, it is not possible to ascertain if this latter hypothesis could account for the frequencies of T cell responses observed. The higher T cell response of animal 1 (20, 21) may simply have been due to the wider range of available restriction elements compared with animal 9. Animal 1 clones expressed a broader range of T cell specificities, with at least four different regions recognized compared with animal 9 clones, which focused on only two regions of FMDV15 (21). In addition, we had previously shown that FMDV15 contains an immunodominant epitope located in the region 149–158, and recognition of this region correlated with high responsiveness (20). A high proportion of animal 1 clones recognized this epitope (8 of 12 shown in Fig. 2⇑), whereas no clones from animal 9 did so (21). By having a wide range of restriction elements, animal 1 may have simply increased the likelihood that it would have restriction elements that bind the immunodominant epitope, leading to higher level of T cell responses seen in the bulk PBMC cultures (20). Animal 1 also had very high Ab levels (21), but it is unclear whether this simply reflects the higher overall T cell response or is due to a particular MHC-peptide-T cell interaction. Because levels of neutralizing Ab correlate with protection (49), the selection of particular restriction elements may determine whether or not an effective immune response is generated. The high responsiveness associated with the duplicated DQ haplotype observed in animal 1 may be a general phenomenon. Of a group of 14 animals, four were originally designated as high responders to FMDV15 in an earlier study (20). 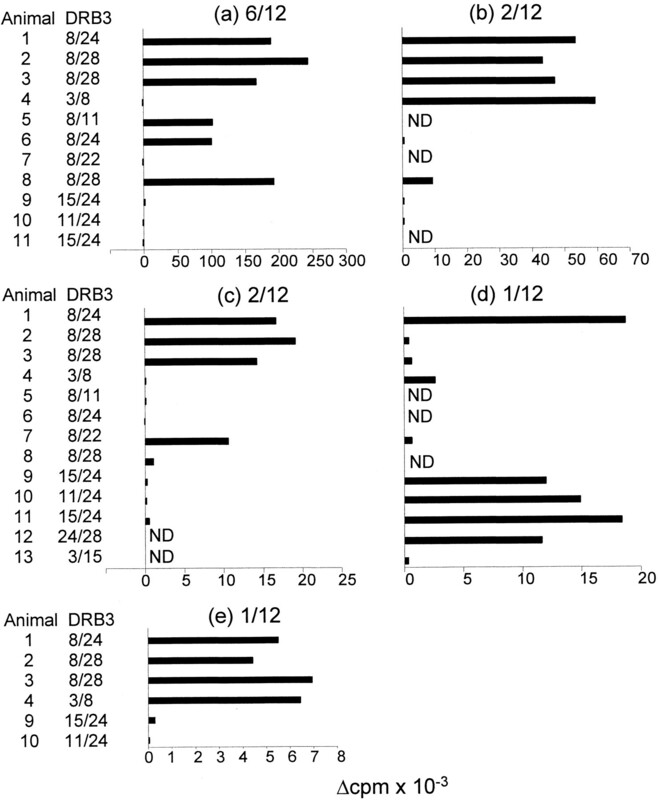 Subsequent analysis has indicated that three of 14 animals had duplicated DQ genes on both haplotypes (results not shown), and all three were in the high responder group (the fourth high responder being animal 1 in this paper). These studies highlight the importance of determining the exact restriction elements used in responses, as information on the haplotype alone is insufficient for rational vaccine design where effective epitope selection is critical. Further understanding of the functional significance of the DQ-restricted T cells is essential for future vaccine design for cattle, but may also shed light on the role of DQ in other species. mAbs R1 and J11 were kind gifts from colleagues from the International Livestock Research Institute, Nairobi, Kenya; and VPM Abs were kind gifts from Dr. John Hopkins (Veterinary Pathology, University of Edinburgh, Edinburgh, U.K.). ↵1 This work was supported by the Biotechnology and Biological Sciences Research Council. ↵3 Abbreviations used in this paper: FMDV, foot-and-mouth disease virus; BoLA, bovine lymphocyte Ag. Baldwin, C. L., W. I. Morrison, J. Naessens. 1987. Differentiation antigens and functional characteristics expressed by bovine leukocytes. M. Miyasaka, and Z. Trnka, eds. Comparative Aspects of Differentiation Antigens in Lympho-Haemopoietic Tissues 455 Marcel Dekker, New York.